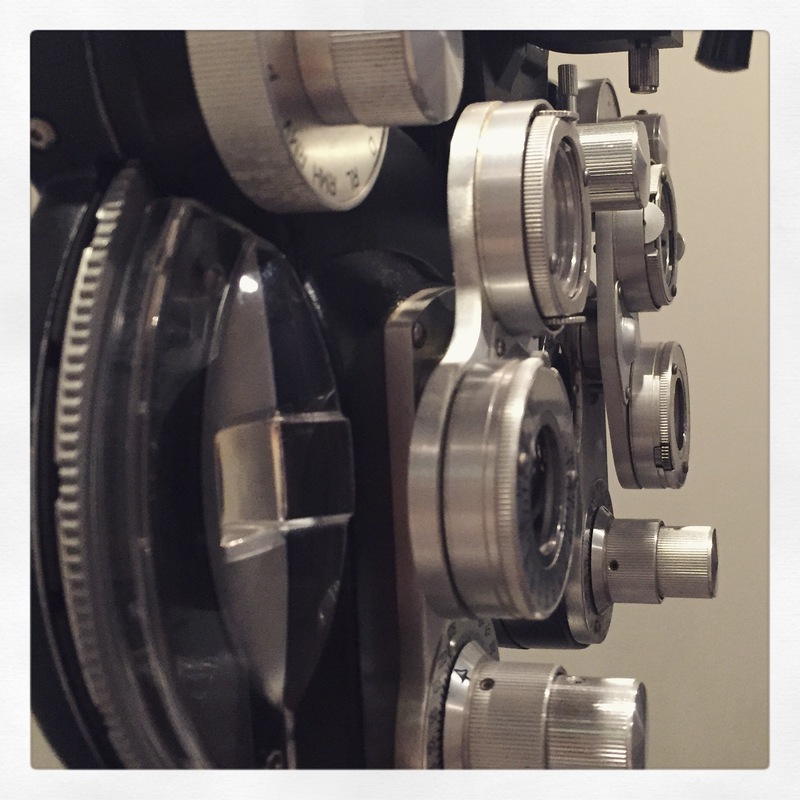 We finally have more updates on O’s Ophthalmology appointments to share! 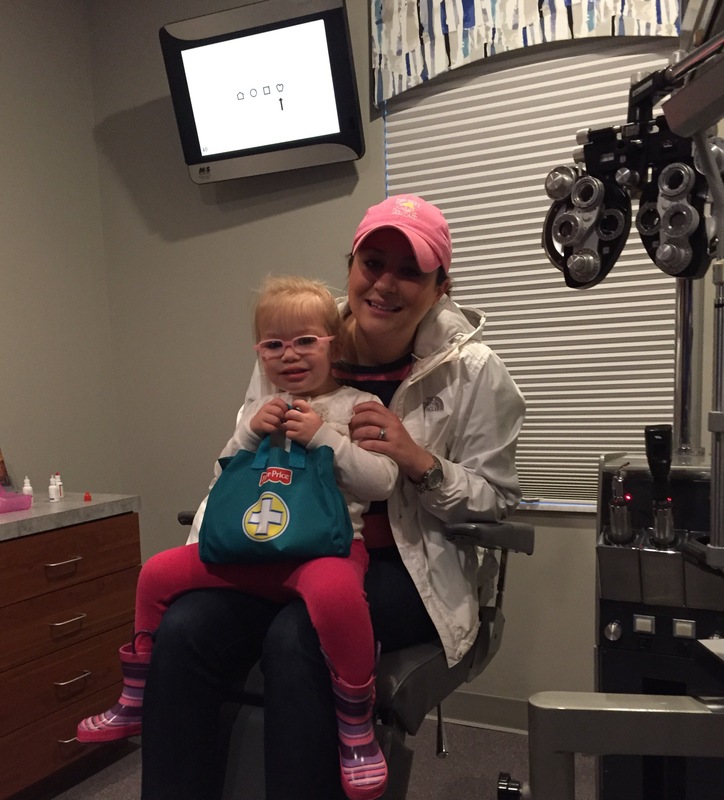 You may recall that she is farsighted (Rx: L +4.5 & R +4.00) with accommodative esotropia and amblyopia in her left eye. If you’re new to my blog you can read more about O’s condition and how we figured it out here, here and here. We hadn’t had an appointment since March so we couldn’t wait to see how things were shaping up for her. We went last week to see what kind of progress she was making with her patching. We had been patching “as needed” an hour or two on each eye, depending which one seemed to have “weaker” muscles demonstrated by intermittent crossing of the weak eye. 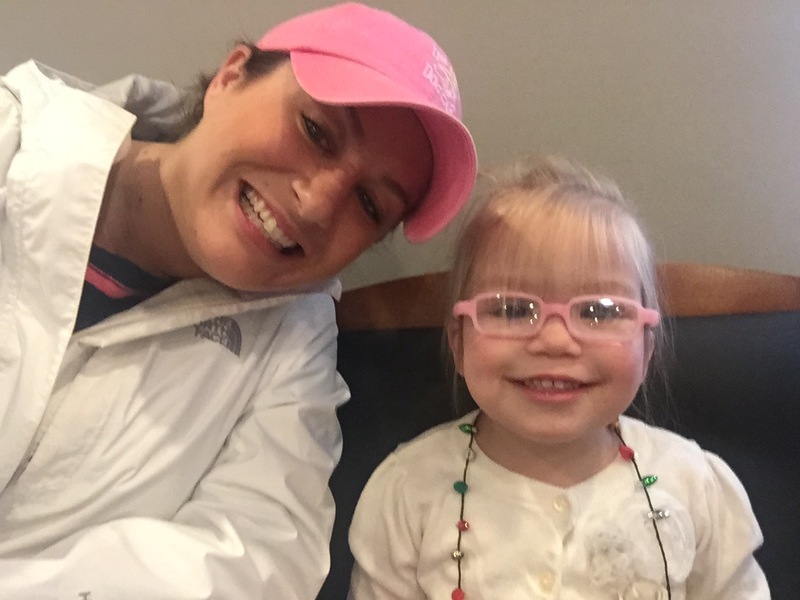 There is no real formula on how to determine how long a kid needs to patch… so even the doctors use educated guesses and trial and error to see what is working for her. The doc seemed to think she was responding very well to patching and is showing progress (verses regression or no change) in her strength. So good news! 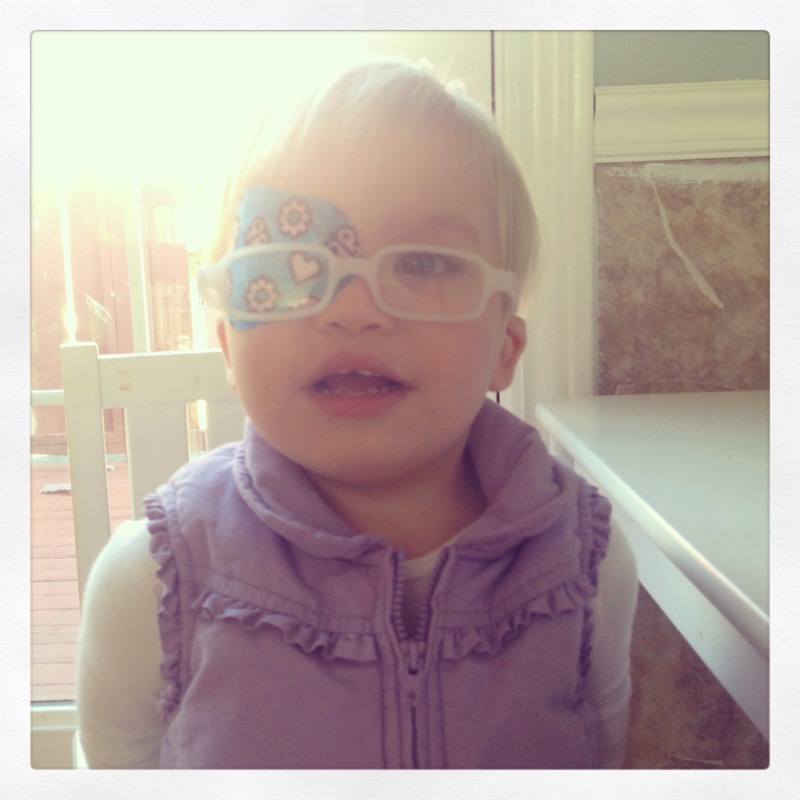 We continue daily patching for 3 hours on her right eye (strengthening her left). Also, the exams are getting easier as time goes on. She is more cooperative, knows what to expect and is super excited to go to our appointments. But that last one may be based on the fact that we promise donuts. Hey, you do what works! Her appointments are easier for us too. Since she is less resistant and there is less crying, squirming and holding her down, then we don’t feel stressed or guilty about the situation. I personally am less anxious about the entire vision situation for her. In part because I’ve educated myself on her individual condition, possible outcomes and treatments and such. It’s much less unknown and so I’ve really had an easier time with it lately. I also credit a facebook group called “Little Four Eyes” for helping me through. It’s an online support group of sorts for parents of children in glasses. It has been a great place to compare notes, swap stories and pictures and find deals on patches. I also have found great gratitude for our situation. O has a considerably minor and easy to treat condition. Some of these kids are dealing with much more difficult or unusual diagnoses. 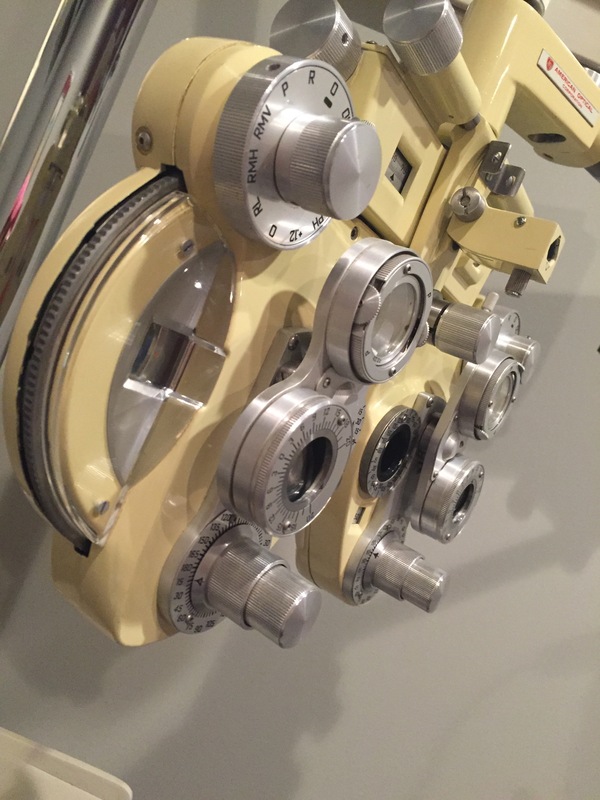 Cataracts, glaucoma, strabismus, and so many things I’d never even heard of. Some have been through multiple surgeries already in their short little lives. I’ve realized how simple her condition is to treat and am so thankful we have the means to help her overcome it. We are blessed with great insurance and the added bonus of vision insurance, access to amazing professionals as well as consistent paychecks to help us pay for it all. We’ve been embracing patch time with O. She’s moved on from her recent playdoh obsession to now loving paint. She’s been watching me paint forever and I recently gave her brushes that she pretends to paint with all the time. My sister came over the other day and brought along paint and canvas. O was in heaven! 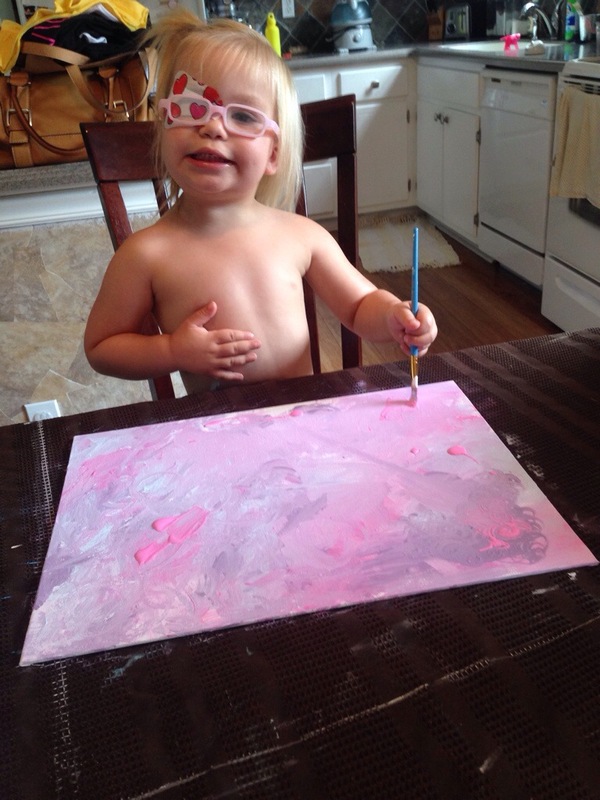 We stripped her down (since this is acrylic), spotted several coordinating colors on each one and let her go to town. This way there wouldn’t be a muddy mix of colors since we kept them in the same family (pink, blue, purple and white) and we did it again with blue, green, yellow and white. We loved watching her paint. She was concentrated and intent with each stroke. I could tell she was taking pride in her work. She made two masterpieces. Once for our house. I think it may even end up on the gallery wall! And another for her grandparents. O had so much fun that she even stopped caring about being messy! Usually she has a paper towel by her side during every meal and craft. But today she let loose and jumped right in. 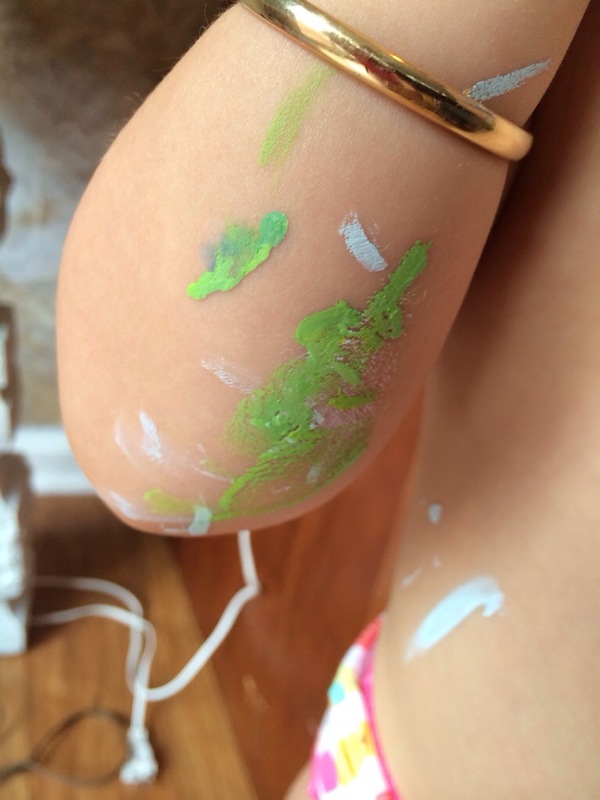 Below is her forearm, complete with gold bangle bracelet and paint. We call her “Baby GotRocks,” you know!